Once again I have a mystery to solve. I know the little boy on the left is my grandfather Chuck Lowry. He was probably two or three years old at the time; the bobbed hair certainly places this photo before the summer of 1928 when my great grandparents had it cut in favor of a more traditional hairstyle for a little boy. The mystery is in identifying the two girls in the photo. I have no idea who they might be. Obviously they are older than my grandfather. Perhaps they are neighbors or cousins? I will add them to the list of people I want to identify. The longer I do this Photo of the Day project, the longer that list grows. 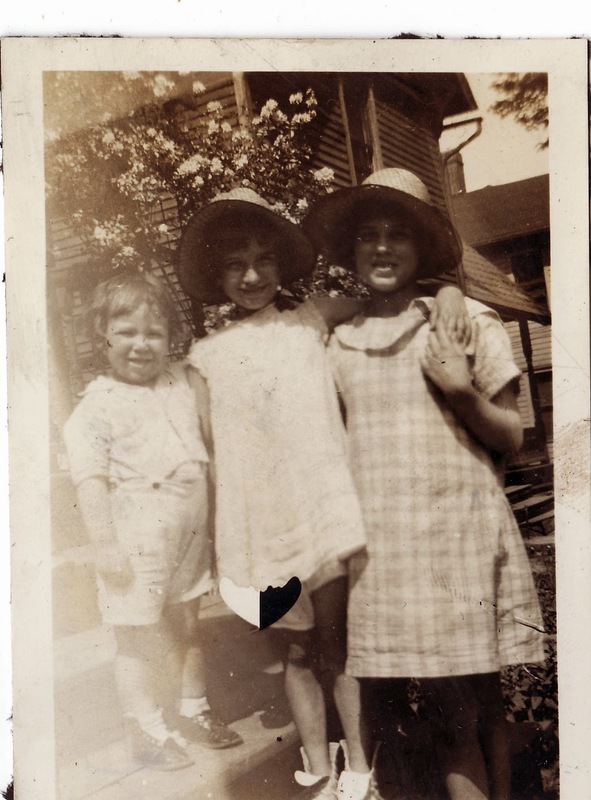 Charles Lowry (1924-2007) and two unknown girls, photograph, taken at unknown location around 1927; digital image, photocopy of original, scanned in 2013 by Joseph Lowry; privately held by Mary McCaffrey, [address for private use], Canton, Ohio. Three children standing on the steps of a home; two girls wearing hats. Provenance is Mary Pepperney Lowry to Charles Lowry to Mary McCaffrey. ← What’s My Ancestor Score?